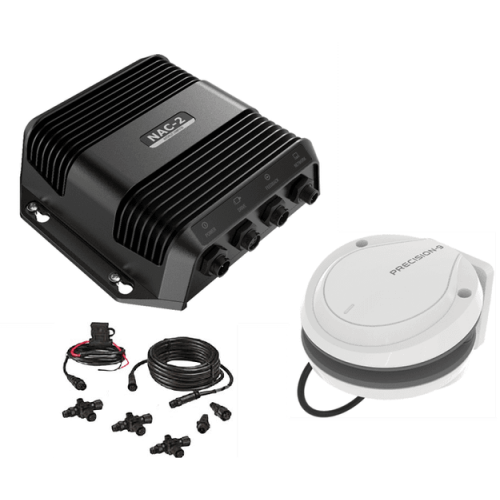 Navico NAC-2 VRF Core Pack: Comprising of the low-current NAC-2 autopilot computer and Precision-9 compass. NAC-2 VRF Core Pack: Comprising of the low-current NAC-2 autopilot computer and Precision-9 compass. The NAC-2 Autopilot Computer is the brains behind your autopilot system. NAC-2 contains the control algorithms developed to helm a yacht across a broad range of weather conditions and sea-states, alongside the electronics needed to operate a hydraulic or mechanical drive unit, while also interfacing with other components including heading sensors and rudder feedback units. The NAC-2 was designed for boats up to 10 metres (33 feet) in length and is suitable for low-current hydraulic drives, mechanical drives, or solenoid valves with a current rating of 8 Amps continuous (12 Amps peak).